Thing the Second: For those who have asked, yes, most of my books are available as ebooks. Almost all of my titles from Immanion Press/Megalithica Books are available on Smashwords (scroll down as mine are mixed in the list) in a variety of formats for $5 each. Additionally, most are also on Kindle (though New Paths to Animal Totems, which is published by Llewellyn, costs a bit more via Kindle). You can, of course, get dead tree versions, but for those who have e-readers or who are on a tighter budget, the ebooks may be a particularly good option. (On the other hand, I can’t sign an ebook, so you’re always welcome to buy signed paperbacks from me, which I always appreciate since I get to keep more of the cash to pay bills!) Finally, continuing in the budget discussion, while my IP/MB published books tend to not cost much less used than new, New Paths to Animal Totems is selling for under $3 for used paperbacks on Amazon. I have been utterly crazed as of late. I’m halfway through my temporary stint as a mental health counselor at my old internship site, and while it’s going quite well, I don’t have a lot of time for art and writing (comparatively speaking, anyway). The past few days have been especially busy; I’m vending at Faerieworlds again this year (and presenting a workshop on shapeshifting dance on Sunday) and so I’ve been busy trying to make enough stuff to fill my booth. I spent the weekend making artwork, though, and it was absolutely glorious being able to immerse myself in creativity again. 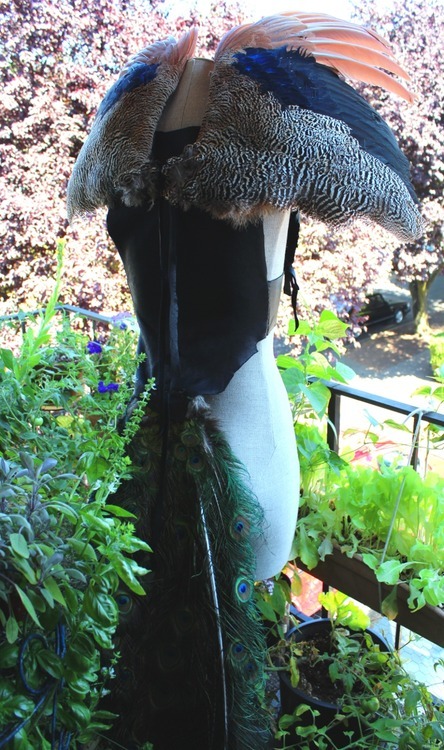 One of the costume pieces I’ve been working on for FaerieWorlds, featuring a real peacock tail and wings obtained from a taxidermist. If you’ve been missing out on my writing lately, you may wish to check out my new spot over at PaganSquare. Since this blog has become fairly conceptual, I’ve made my PaganSquare venue into a how-to blog, and I’m starting with some basics before moving on to more specialized topics. Right now I’m in the middle of explaining the basics of how I work with spirits; feel free to go take a peek. Also, I’ve been fortunate enough to score a spot at the community garden a few blocks from my home, after being waitlisted for three years. It was pretty badly overgrown with weeds when I inherited it, but I’ve managed to get most of them pulled and piled for compost, and am getting prepped for fall planting. Finally, a bit of good news on the book front: Facing North gave a good review to New Paths to Animal Totems. As an aside, while buying a book directly from me gets me the most money for it, I also know plenty of folks are on a budget. Amazon currently has copies starting at $1.50 each, and hey, if you buy used it’s extra eco-friendly! Also in the book realm, I’m working on the revision of Plant and Fungus Totems: Connect with Spirits of Field, Forest, and Garden (formerly New Paths to Plant and Fungus Totems), which should be out from Llewellyn next summer. I’m quite pleased to say that Christopher Penczak was gracious enough to write a beautiful foreword for it, and overall the editing process has been going well, too. So I feel pretty good about the book in general, and I’m looking forward to inflicting it upon my now-forewarned audience. I try to not talk too much about my professional writing pursuits here, since this is mainly a blog about my shamanic practice, and I figure most folks who are interested in my books/etc. will go check the link list. However, I did want to bring attention to a recent project that’s been published that’s relevant to some of what I’ve talked about here. Talking About the Elephant: An Anthology of Neopagan Perspectives on Cultural Appropriation is the first anthology I’ve edited. It came out last month through Immanion Press/Megalithica Books, who have published my other books as well. Talking About the Elephant is a collection of essays from a diversity of authors coming from backgrounds ranging from Celtic Reconstructionism to neoshamanism to ritual magick, and then some. I tried to create a collection of essays that presented numerous perspectives on the issue of cultural appropriation in neopaganism, rather than just a bunch of people saying the same thing different ways. I figured that since I’ve talked a fair bit about cultural appropriation and shamanism here, that readers may be interested in the anthology. There’s more information at the link above; if you want to order a copy directly from me (it’ll be signed by me as well as my husband Taylor, who was also an essayist), be aware that my first shipment of copies just sold out a couple of days ago; I’m expecting a new shipment around the end of the month, but you can go ahead and get an order in to reserve your copy. Keep in mind, of course, that I’ve only been actively pursuing a (neo)shamanic path since September 2007. However, I have spent over a decade as a solitary, self-taught pagan, and so discerning useful books from not so useful ones has become an acquired skill. These books can all be found in my bibliography; however, I’ve extracted a few particularly good for beginners (and yes, I fully admit to having cut and pasted the information from my biblio). Additionally, I strongly recommend checking the shamanism-related links in my blogroll. I’ve listed the books in the order I think would be most useful to read them in (separated into two different categories, neoshamanism and traditional shamanism–you don’t have to read the neo before the trad). This is pure neoshamanism–and the author gets points for admitting it up front. It’s a great guide to making shamanism relevant to mainstream postindustrial societies, and is a nice, down to Earth exploration of the concept. It’s got a good mix of theory and practice, too. 101, but it gave me some good ideas for integrating my practice into everyday life. It’d be kinda tough to study neoshamanism without reading this book. 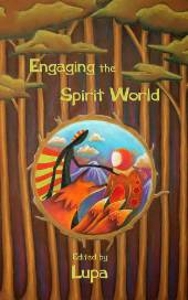 Harner isn’t teaching “genuine Native American shamanism”; rather, he did to shamanism what Carroll did to magic in general–boil it down to its bare-bones components, sans cultural context, and present it as a working system for modern practitioners. Unfortunately, he only presents a partial perspective on what shamanism is, and leaves a number of cultural elements in there that can lead people to believe they’re doing it “just like the Indians”. I think the misunderstanding people have is that this book–or the weekend seminars that have ultimately derived from core shamanism–will automatically make you a shaman. I think it’s more accurate to say it can make you a practitioner of shamanic techniques, but one book a shaman does not make. Still, this is a useful handbook for said techniques, and as long as it’s taken in the proper context it’s an okay resource. This is a very important book to me. Essentially it takes shamanism and plants it firmly in ecological awareness and environmentally friendly practices. While traditional shamanism isn’t all about environmentalism, therioshamanism is very much an environmentally active practice. It’s quite obvious that Endredy knows his stuff, both with wildcraft and shamanism, and it’s one of my favorite texts for reminding me of my focus on the Earth. I like this book because it’s a good anthropological introduction to shamanism–primarily traditional, but with a brief mention near the end of neoshamanism. It’s a nice blend of text and illustrations, and the author covers a lot of ground. He seems particularly interested in altered states of consciousness, and the involvement of the shaman in both the community overall, and politics (including conflict with large governments–shamanism as subversive!). Yes, I finally got around to reading this classic. I enjoyed it quite a bit, though chewing through hundreds of pages of pure vintage academia took two weeks. It’s going to be one of those books that I go back to every so often to re-read, and will probably get more out of with each time. It’s apparently withstood the years pretty well, too–while there’s obviously newer material out there, it hasn’t become obsolete. I can appreciate the comparative aspects of the book, though it’s also good to see how cultures have different cosmologies and traditions. A nice thorough resource. This is a superior academic text on the psychology of shamanism. Unlike earlier academic works, though, the author is careful to not allow Western bias to color a negative picture of the topic. Rather, he explains in great detail (and with in-text citations, even!) about how shamanism differs from schizophrenia and other mental illnesses, the psychology behind shamanic healing (such as the placebo effect), and the psychological states involved in initiation and journeying. 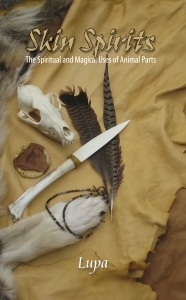 I took away a much better understanding of the internal mechanics of shamanism from this book, as well as some good arguments against “shamans are crazy”. One of the most recommended books on this list. This is an awesome anthology with a great collection of primarily academic perspectives on both traditional and neo shamanism. While I didn’t like every essay, I did learn quite a bit from it, particularly on some of the more interesting niches, such as Siberian shamanic gender roles, the aesthetics of Korean shamanism, and Russian documentaries on shamanism. I wasn’t as impressed by most of the essays on neoshamanism, but it was nice to see them included instead of ignored. The writing on some of the essays is somewhat tough to chew through if you’re not used to academic writing, but this didn’t hinder me too much. These aren’t the only books on shamanism I’ve read; you can see more at Pagan Book reviews. But this is a brief booklist I’d recommend for beginners and the curious. I’ll probably add to it at a later date, but it’s here for posterity (and my easy linking needs).